Kingston rower Will Crothers claimed the Kingston area’s fourth medal of the XVII Pan American Games Monday, a gold as part of Canada’s championship men’s four in the rowing regatta at St. Catharines. Crothers was in the bow seat of the Canadian boat that finished the race in 6 minutes 10.80 seconds, 3.23 seconds ahead the silver medal-winning Cubans. Argentina claimed the bronze medal. That time was eight seconds faster than Crothers, Tim Schrijver of St. Catharines, Kal Langerfeld of Parksville, B.C., and stroke Conlin McCabe of Brockville posted in winning their heat Saturday. In Monday’s race, the Canadians were even with the Argentine boat at 500 metres but they had a one-second lead by the mid-point of the race, and they increased it by about a second in each of the final two 500s. 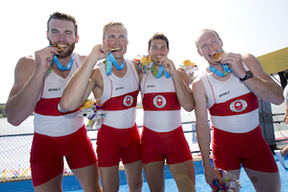 The medal was one of four won Monday by Canadian crews, who reached the podium in all four rowing events where finals were held. Crothers’s medal follows those won Sunday by Napanee’s Brittany Benn and former Queen’s University player Nadia Popov of the women’s rugby team and ex-Queen’s Gael Matt Mullins with the men’s rugby side. • Regiopolis Notre Dame grad Kate Gillis scored three goals to lead Canada to a 12-1 win over the Dominican Republic on the opening day of the women’s field hockey tournament. • Danielle Boyd, with skipper Erin Rafuse of Halifax, had two fifth-place finishes and a sixth in three women’s 49er FX races in the sailing regatta on Lake Ontario off Royal Canadian Yacht Club. The Canadians stand sixth after four races with 23 points. Victoria Travascio of Argentina, with two race wins, leads the fleet with eight points. • Queen’s grad Evert McLaughlin had third- and sixth-place finishes in open Snipe sailing competition and stands third overall after three races with 12 points. Luis Soubie of Argentina, who has won two of the three races, leads the 10-boat fleet. • Terry McLaughlin, also a Queen’s grad, won both of his races in open J-24 competition and leads the fleet after three races with four points. Matias Pereira of Argentina, winner of the first race of the series, stands second with 11 points. Tuesday, Kingston’s Rob Gibson rows for gold in the men’s quadruple sculls final at 10:15 a.m. in St. Catharines, while sailing resumes in all divisions, with Boyd scheduled for three races and the McLaughlins for two each in Toronto.